You can be doing everything right on your YouTube channel, have some great videos and have the channel set up perfectly, and yet people still might not become subscribers. And it’s because you haven’t asked them to subscribe! It seems unnecessary and I know a lot of creators don’t want to sound ‘pushy’ with constant requests for people to join their subscriber community. The fact is that’s exactly what it takes to build a subscriber following on YouTube. You have to ask…no you have to tell people to subscribe. I’m going to reveal three ways to grow your YouTube channel, how to use each and how to turn it into a community of cheerleaders. These ideas work and they’re the reason 3% of my viewers turn into subscribers versus a ratio closer to 1.4% or less for most channels. 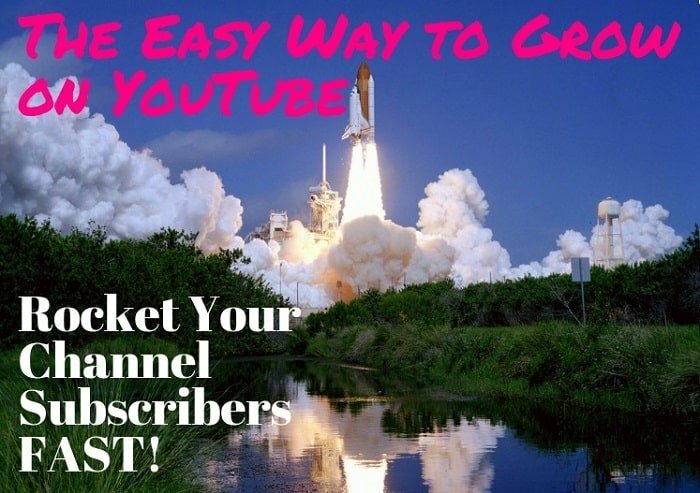 We’ll talk about building a community and giving people a reason to subscribe but the best and easiest way to grow your YouTube subscribers is just to ask. I understand you don’t want to come off as pushy or maybe you reason that if your videos are just so awesome, people shouldn’t need to be reminded about subscribing. The fact is, even the best and most professionally-produced channels on YouTube need to remind people that subscribing is even an option. The problem is that most people still watch YouTube as a how-to platform or just end up there casually to watch the latest cat video. They don’t think of the platform as a legitimate alternative to TV. They may not even understand that subscribing to a channel is free or that it helps them find videos that will help them. People have never needed to ‘subscribe’ to their favorite TV channels. They’ve got a guide to tell them what’s on and may even know the schedule for a favorite network. Until it becomes the same way on YouTube, you need to explicitly ask people to subscribe and remind them why they should. A small subscribe watermark that stays in the lower-right corner through the video, something we talked about setting up your YouTube channel. That gives me three to four requests for subscribers in each video. You better believe, if someone is even thinking about subscribing to the channel, it’s going to be in their head. 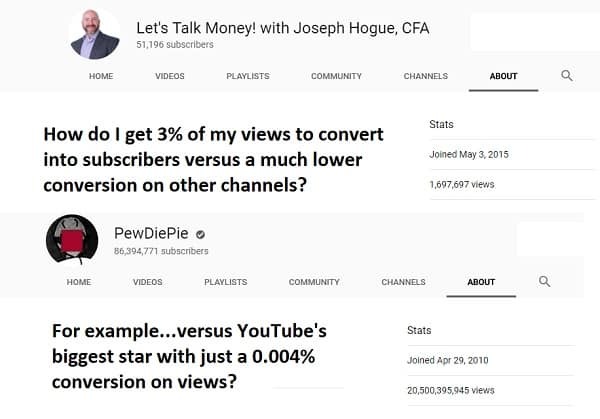 Asking people to subscribe is one way to grow your channel but you also need to give them a reason to subscribe. The obvious way is to just produce amazing videos that people can’t resist…ok, sometimes a little easier said than done. More powerful still is to make your channel a community. Make your channel a community where people can engage each other and share their opinions and you’ll build more than a channel, you’ll be building a movement! A lot of the brand building ideas we talked about previously will come into play here. By connecting with those shared beliefs and through an iconic leader, you’ll find people that will feel a special connection with your channel. Responding to comments and using the community tab, will cement that relationship. You’ll still need to ask people to subscribe but building this sense of community will make joining your channel a no-brainer for many. It may take a couple of videos before they actually click the button but talk up the inclusion and how great the community is and they’ll click the button just to not be left out. In fact, build a community around the channel and it will go a lot farther than just growing subscribers. You’ll get cheerleaders that will share your videos with their friends. You’ll have a constant base of comments on new videos and a rabid followership that will defend you against any trolls that dare speak ill of the channel. We highlighted a social media strategy for YouTube last week and getting subscribers is where that really starts paying off. Platforms like Facebook and Twitter may have created the social media revolution but people are still looking for that face-to-face connection. They still want to feel included in a community and have true friends that are more than just a ‘Like’. That means sharing your videos on other social platforms isn’t just about getting views but about bringing people over from those sites to join your YouTube community. Talk up the growth of your YouTube channel community, posting images of subscriber milestones. I guarantee, anyone that sees 50,000 people have joined your channel is going to wonder if it might be right for them. Promote YouTube-only events and videos that won’t be shared anywhere else. Growing subscribers on YouTube doesn’t have to be as complicated as most creators make it. You’ve given them a reason to subscribe through quality videos and a professional-looking channel. Most creators just need that last little nudge to send their subscriber growth into overdrive. For that, you’ve only got to ask and make it about the community.